Adam's favorite inspiring creator is the street artist Banksy in NYC. Here is a photo of Adam's favorite piece of work! Look at how the use of "painted light" makes the balloon look 3D! Our Winter 2015 Quarterly Update has been mailed out! If you'd like to be added to the newsletter list so you receive future updates in your inbox, please email us at nicki@ald.lighting! Lighting designers often do image research when approaching a new project and many can find inspiration in nature, in photography, or in fine art. Kathy's favorite "painter of light" is Johannes Vermeer, a 17th century Dutch painter. 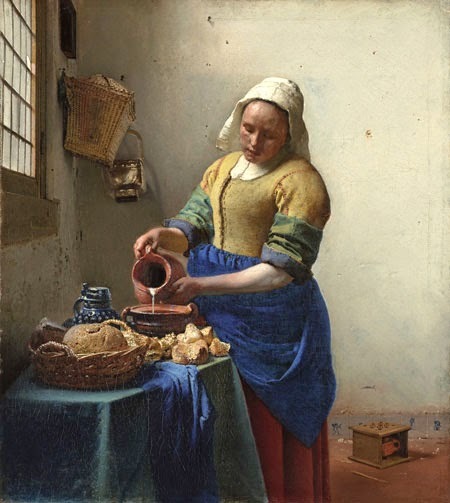 Kathy's favorite Vermeer masterpiece: "The Milkmaid"
For five years now Luminothérapie has been an integral part of Montreal’s battle against the winter blues. Luminothérapie is a festival where art, design and light come together. The festival installations are designed to bring light and fun to drab Montreal public spaces during the winter months. This year's installation is called PRISMATICA and includes fifty 6-feet-tall prisms placed on turning pedestals. People can interact with the exhibit by spinning these prisms to produce soothing musical notes and to change how the light interacts with the prism and surrounding area. According to the article on LEDInside.com, "the prisms are made of panels covered with a filter that transmits and reflects every color in the rainbow, varying with the position of the light source and the observer.The prisms are mounted on bases that contain light projectors and speakers. As they pivot, they create polychromatic effects accompanied by a series of variable-intensity bell sounds." For more information on this installation, check out LEDInside.com! It's great how people can use light to help combat the winter blues! It's something we can all use after being buried under so much snow! 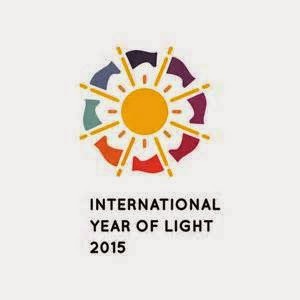 The UN declares 2015 the International Year of LIGHT! The United Nations has declared 2015 the "International Year of Light and Light-Based Technologies!" "In proclaiming an International Year focusing on the topic of light science and its applications, the UN has recognized the importance of raising global awareness about how light-based technologies promote sustainable development and provide solutions to global challenges in energy, education, agriculture and health. Light plays a vital role in our daily lives and is an imperative cross-cutting discipline of science in the 21st century." The Year of Light is an international event and many countries are hosting their own unique on-going events as part of the celebration. This event calendar can be found online on the UN's website and can be searched by country! The closest current event to our home office in Rhode Island is the "PhotonSelfie" in Norwich, CT. There is also an upcoming event later in the year scheduled for Cambridge, MA called "Light: Beyond the Bulb." These events are meant to show people of all ages the central role of light in science and culture. How are you planning to celebrate the YEAR OF LIGHT? ?